I am very excited about a new book by one of my favorite authors whose work I have never read. Huh? 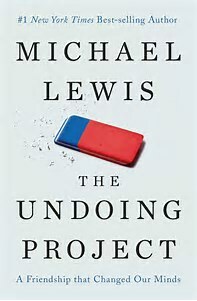 Michael Lewis has just released “The Undoing Project: A Friendship That Changed Our Minds.” It is a story about two psychologists who started their life’s work together at Hebrew University in 1969. Amos Tversky and Daniel Kahneman are known for their study and discovery of many of the reasons for human irrationality. Their findings are not limited to the mentally ill—quite the contrary. These are lessons each of us can use. Especially these days. The reason I am such a fan of Lewis is because he wrote the books that resulted in two of my most recent favorite movies: “Moneyball” and “The Big Short.” These stories fascinate me because they address flaws in long held decision making patterns. “Moneyball” exposed Major League Baseball’s irrational valuation of players and “The Big Short” did the same for our nation’s financial markets. In both stories, the thinking errors were discovered by some very unlikely people. They were nerds, weirdos, misfits. They were geniuses. The habit of going with our gut has a way of failing us like no other reason. Some of these failings are more obvious than others. Good examples that are easy to spot are in sports strategy. Play calling in football, substitutions in basketball, pitching changes in baseball, etc. are easy to laud or boo by the simplest of people, especially me. The more camouflaged errors happen with life decisions like career planning, home buying, business partnerships, etc. These decisions and the process used to make them often are not even reviewed until years after their success or failure. People my age play the game of “I wonder what would have happened if I had…” all of the time. What we don’t often do is wonder why we chose to major in business instead of philanthropy in college. As a middle aged man, I now know generosity makes most people happier than stinginess does, but why didn’t I know that as a young person? David Leonhardt points out this discussion from the book in his review of it in the New York Times. All of us who range from pleasantly surprised to catastrophically shocked by the recent election results should probably read this book and begin evaluating our own decision making patterns. The two psychologists have some invaluable lessons to teach. And while they are no strangers in their profession, Lewis’ book will hopefully push their work into the mainstream. Tversky died twenty years ago. Kahneman went on to win the Nobel Prize and was also awarded the Medal of Freedom by President Obama in 2013. The two men, through their friendship and work together, were clearly on to something big. Finding a better way to make decisions and to judge the things we judge every day. I have often said, though I am sure I am not the one who said it first, that there is a little bit of bad in the best of people, and vice versa. These two thought leaders might say the good makes us overlook the bad, and also vice versa. I wish they could do a modern study of what we now call the echo chambers. Maybe by simply applying their principles it will lead us to ending the crowd in those horrible places for good. Back to my horrible week. The disappointment I was whining about was not really about others. It was about my own instinctive expectations on all of them. A review of each example shows that my negative reactions and misjudgments were solely under my own control. And my predictions of what to expect from these people were not rationally based to begin with. So my wife was right again. No news flash there . But this time I am going to enjoy reading “The Undoing Project” so I can explain to her in detail exactly why she was.